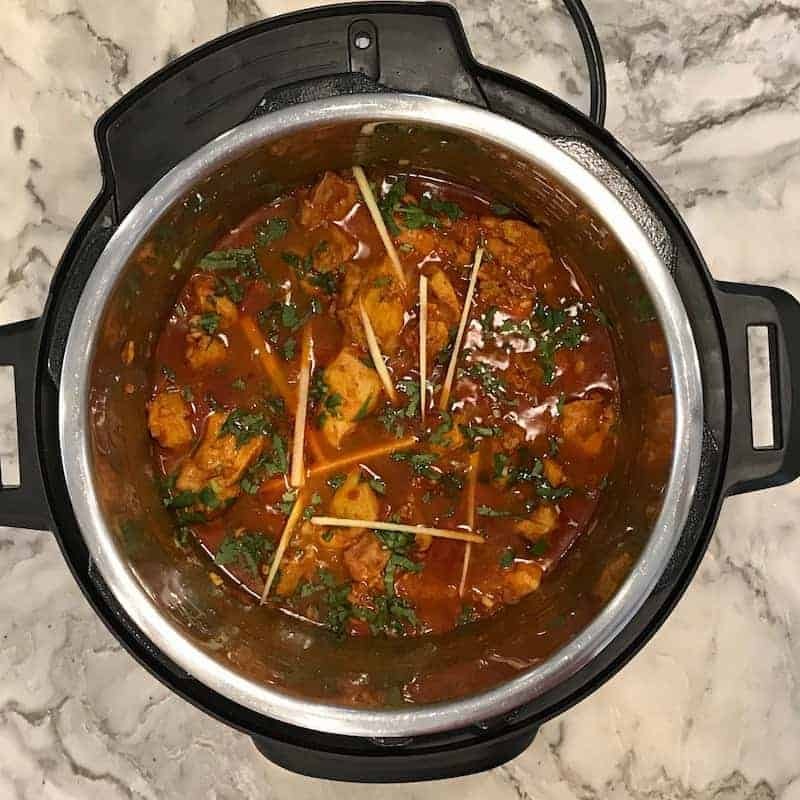 Chicken Karahi or Chicken Kadai is a spicy, homestyle chicken curry with fragrant spices and fresh ginger. 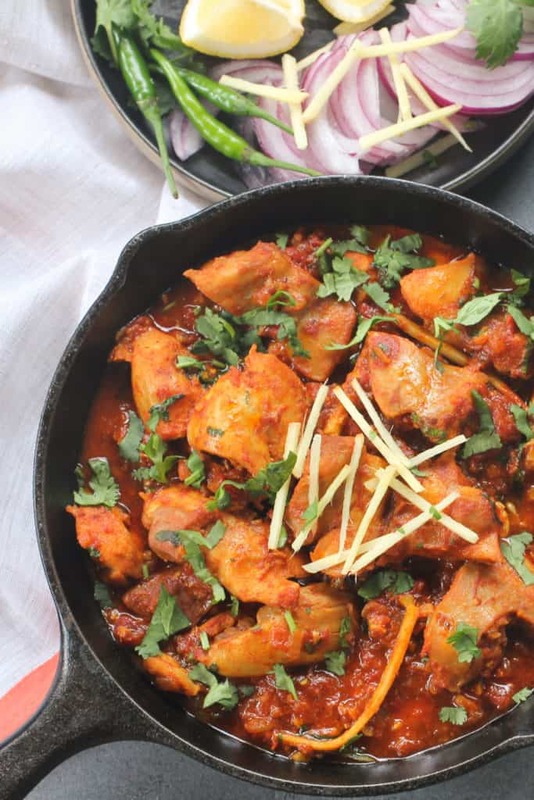 What is a Karahi or Kadai? A thick, circular, metal cooking pot, similar to a wok that is used in Indian cooking for curries, sautéed vegetables and deep frying. 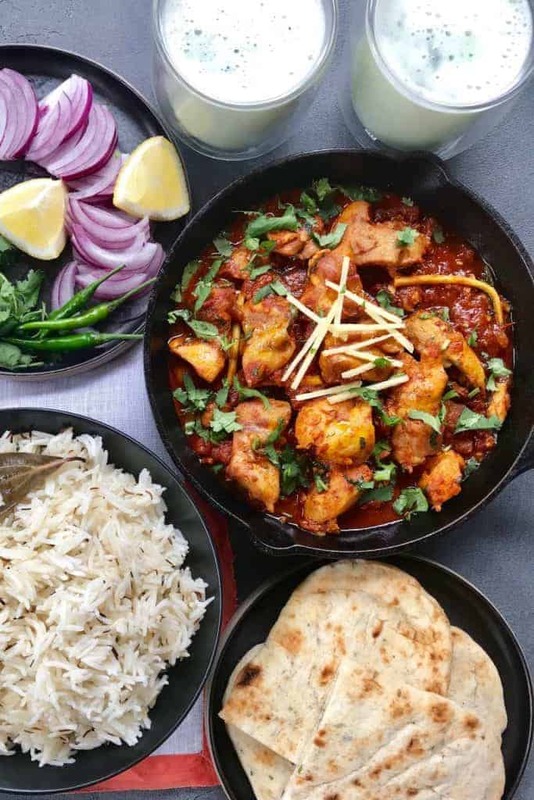 Chicken Karahi is a popular North Indian and Pakistani curry and can be found in most restaurant menus. The road-side dhaba’s often will have this spicy, homestyle curry on the menu which is often enjoyed with hot naan or roti right from the tandoor. 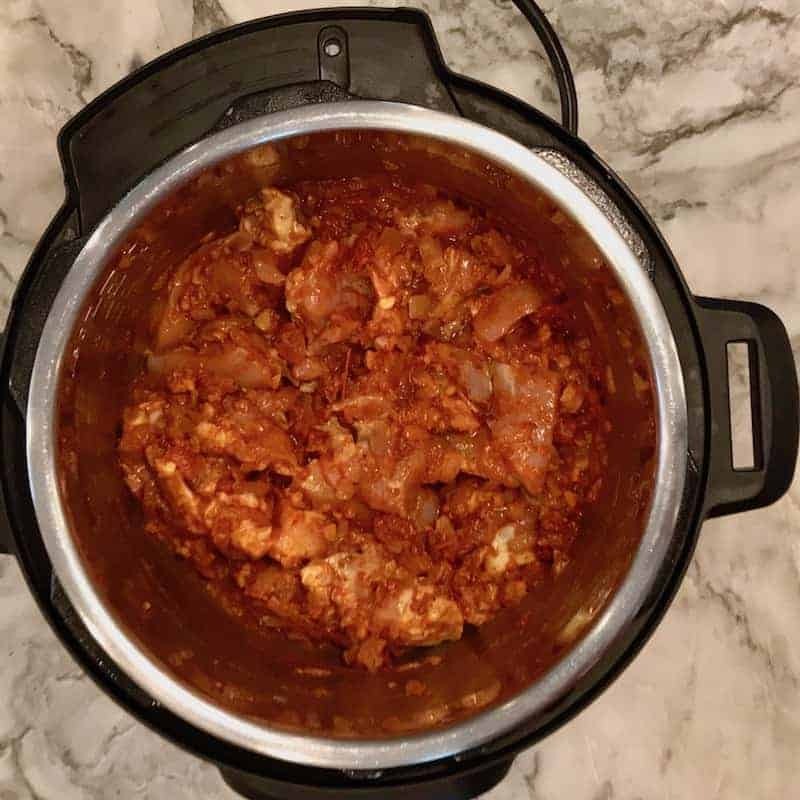 Why make Chicken Karahi in the Instant Pot? 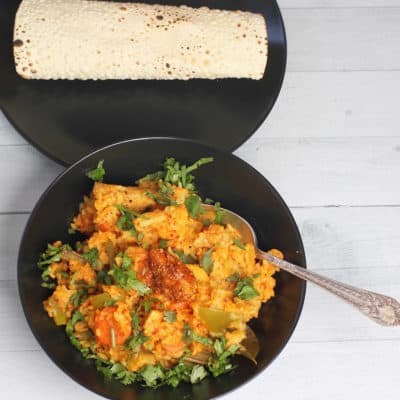 a practical and easy curry, that my students could make and enjoy in under 30-minutes. hands-free recipe compared to the original traditional stove top recipe. perfectly cooked chicken every time. And best of all, authentic and hearty tasting curry! Garam Masala – This quintessential Indian spice bled adds warmth and depth to the curry. Ground Cumin and Coriander – To add earthy tone and body to the curry. 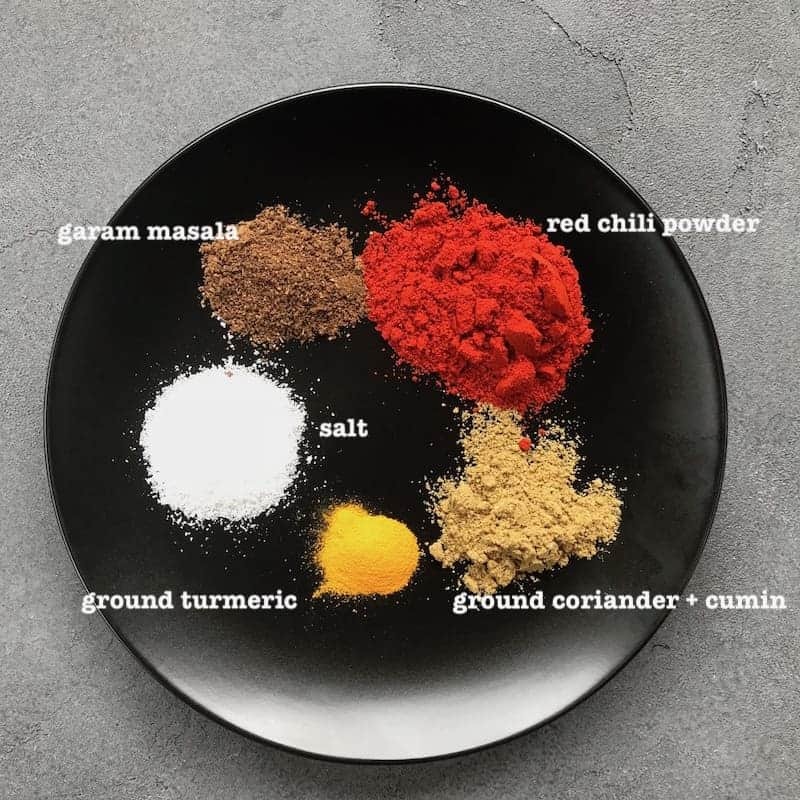 Ground Turmeric – Bright healing spice that adds a peppery-woody taste and a deep golden color to the curry. 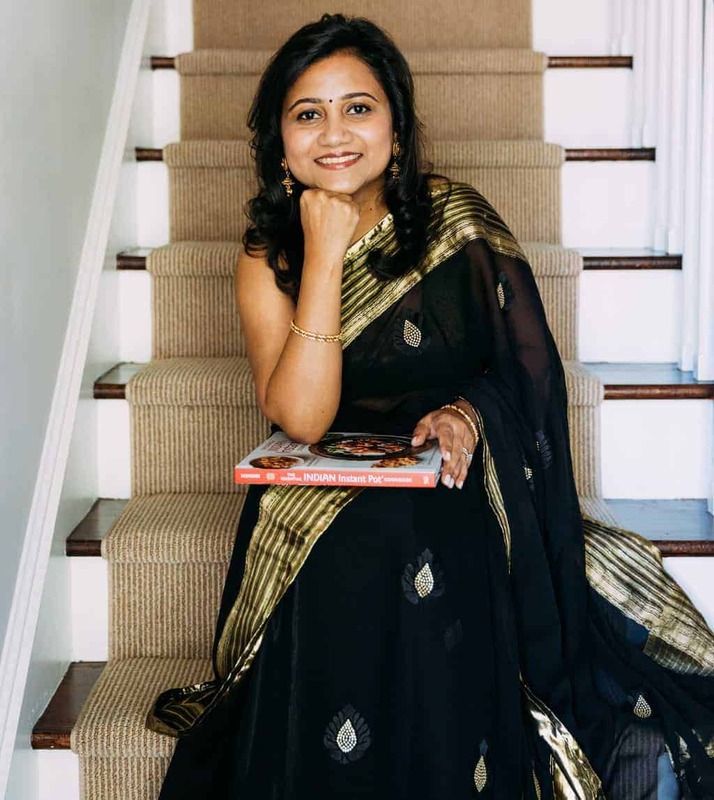 Kosher Salt – Enhances the taste in the curry. You can use table salt or kosher salt in this recipe. 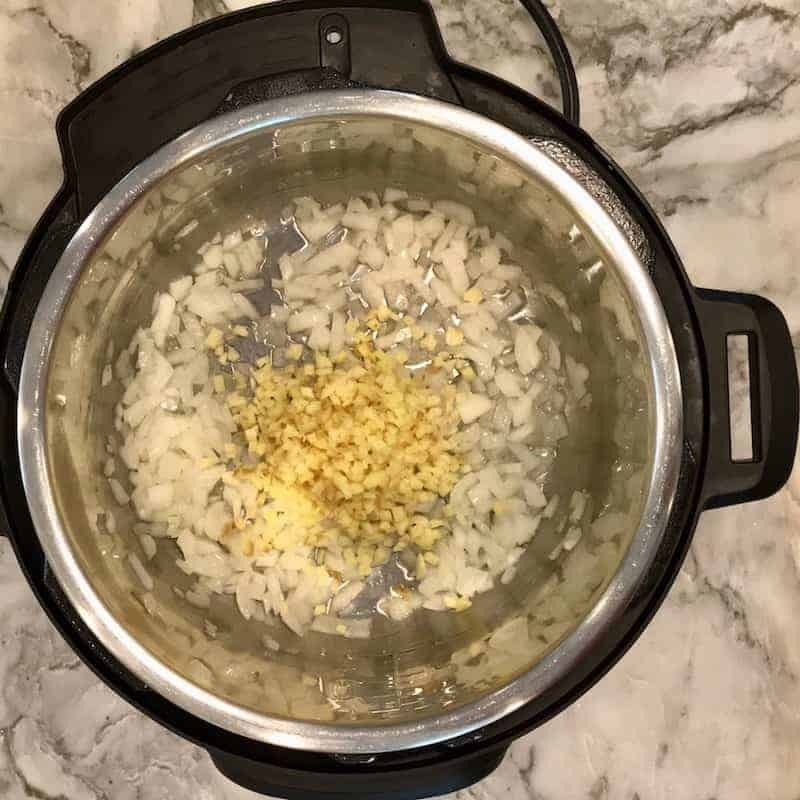 Turn the Instant Pot to Sauté mode and heat oil. Add onions, ginger and garlic and cook for 2 to 3 minutes or until the onions turn translucent. Use glass lid to speed up the process. Add the chicken, tomatoes, spices and stir well. 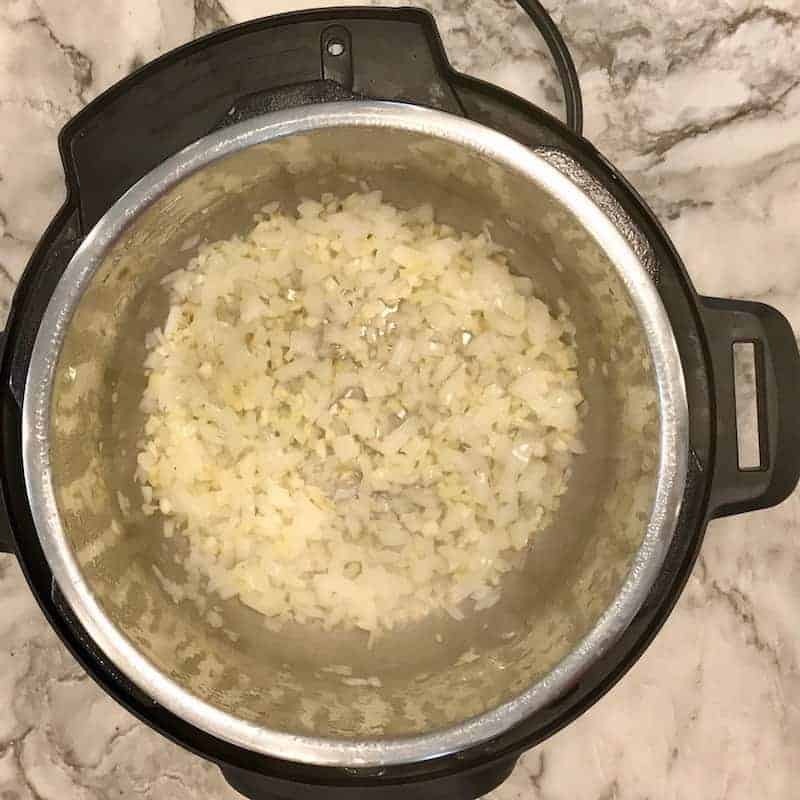 Close the Instant Pot lid on with pressure valve to sealing. Select Pressure Cook / Manual (Hi) for 5 minutes. Allow the pressure to release naturally for 5 minutes. Then release all remaining pressure. 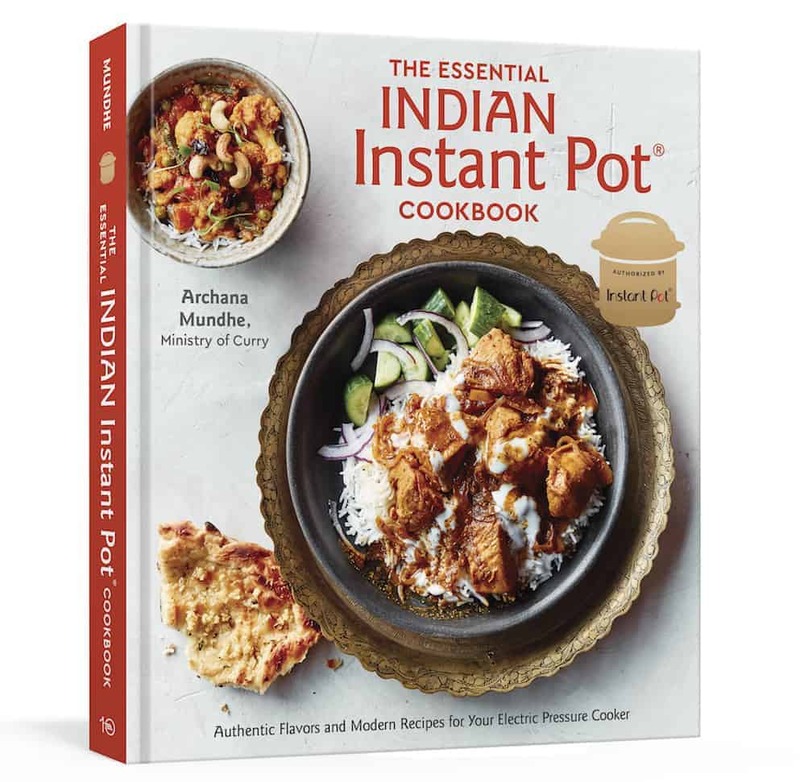 Set the Instant Pot to Sauté mode and cook for 5 minutes as the curry continues to thicken. Garnish with cilantro and ginger. Serve hot with naan and rice. Heat oil in a medium wok or deep pan. Add onions, ginger and garlic and sauté for 5 minutes on high heat until the onions turn translucent. Use glass lid to speed up the process. Add the chicken, tomatoes, all the spices and stir well. Cover the pot with a lid and lower the heat to medium. 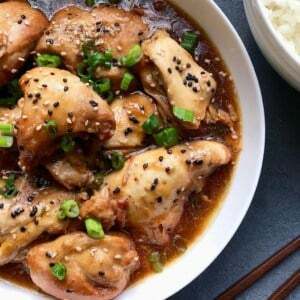 Cook for 15 to 20 minutes or until the chicken is fully cooked stirring frequently. Add a few tablespoons of water as needed if the curry starts to stick to the pot. Garnish with cilantro and ginger. 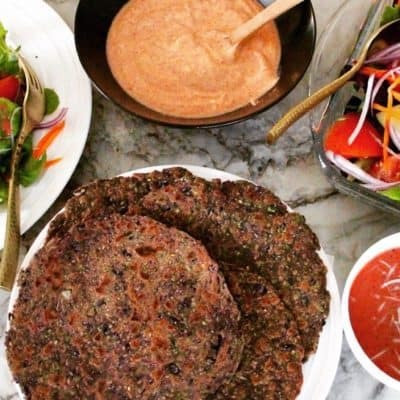 Substitute Kashmiri red chili powder with any mild chili powder. Make sure to dice the ginger very small so you do get big pieces of ginger in the curry. To reduce the spice in this curry, reduce the quantity of red chili powder, garam masala and ginger by half. To make the curry more spicy and hot, add a sliced jalapeño along with the onions. Lastly, I love Pomi chopped tomatoes that taste as good as fresh tomatoes. They come in cartons and come in very handy. Instructions: Blend all the ingredients in a blender and enjoy chilled. 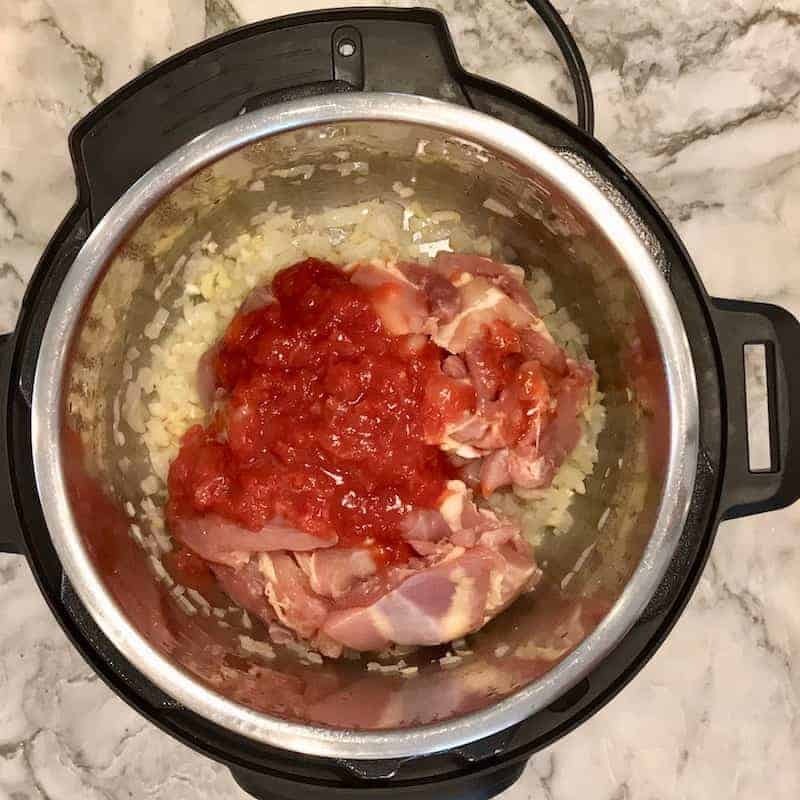 Add the chicken, tomatoes, ground cumin, ground coriander, garam masala, Kashmiri red chili powder, ground turmeric and salt. Stir well. 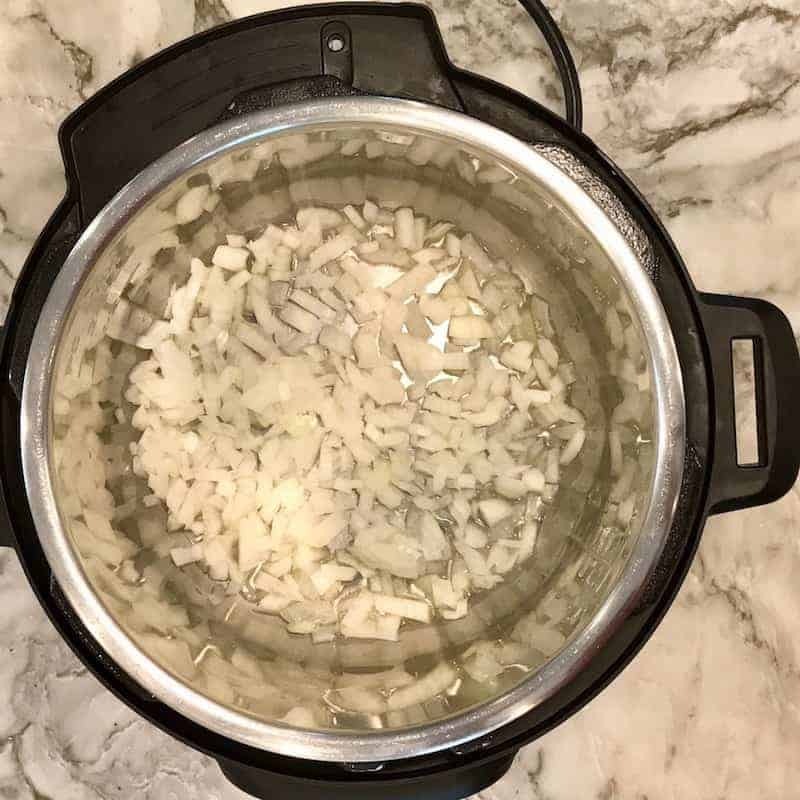 Close the Instant Pot lid on with pressure valve to sealing. Select Pressure Cook / Manual (Hi) for 5 minutes. Allow the pressure to release naturally for 5 minutes. Then release all remaining pressure. 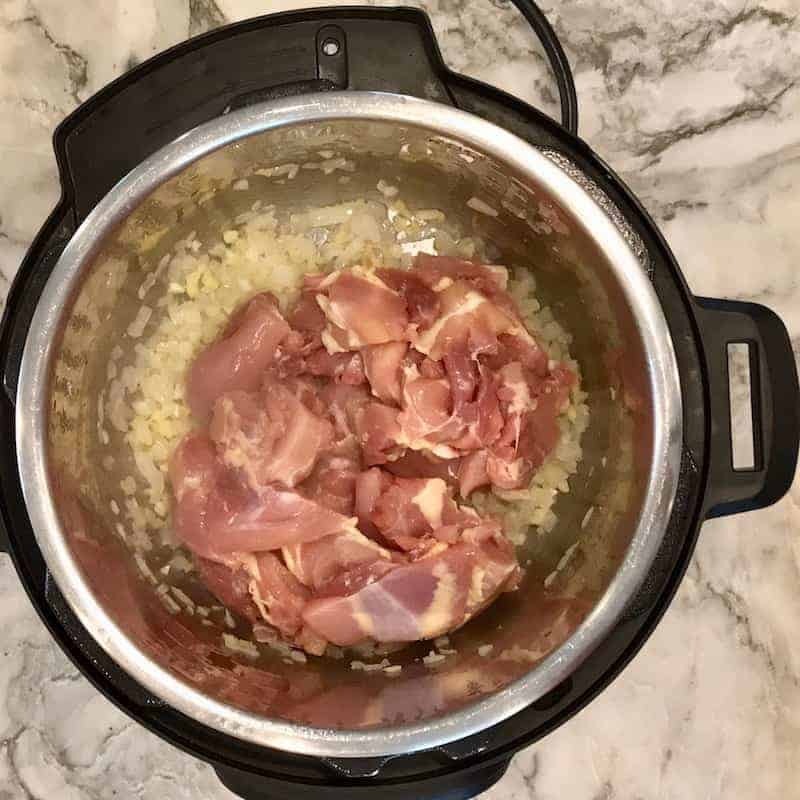 Set the Instant Pot to Sauté mode and cook for 5 minutes as the curry continues to thicken. Garnish with cilantro and ginger. Serve hot with naan and rice. I love POMI brand chopped tomatoes that taste as good as fresh tomatoes. They come in cartons and come in very handy. You can either use fresh tomatoes or Pomi chopped tomatoes in this recipe. Can you use bone-in chicken for this? Maybe leg quarters or whole chicken? If so, how would you adjust the cooking time in IP? Hi Asim, Yes you can. Depending on the size of the chicken pieces I would add extra 2 to 3 minutes. For example if I cooked this with let quarters I would cook for 8 minutes. Yum i made this tonight and it turned out delicious! I ended up using chicken breast tenders.. it was very spicy but next time will cut down a bit on the spice like you mentioned in the post. Will definitely be making often!! Thanks!! Thank you for the recipe. It looks amazing. What is the size of your instapot? Looks delicious. The step by step process is clear and super recipe. Hi! Do you mean 1/4 cup ginger before dicing or after dicing? I generally grate my ginger in the micro plane to get small pieces – so how much of that? 1-2 tablespoons? Thanks!! 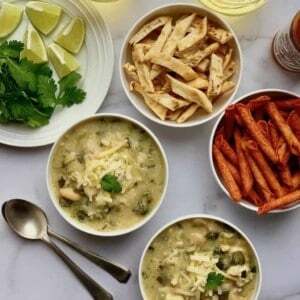 Great recipe, just made it last night for the family and they loved it. 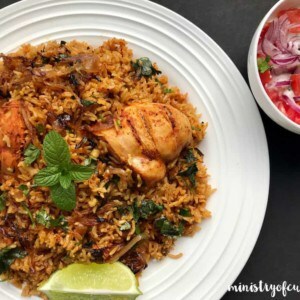 “Homestyle” is the right word – tastes like what my mom makes! 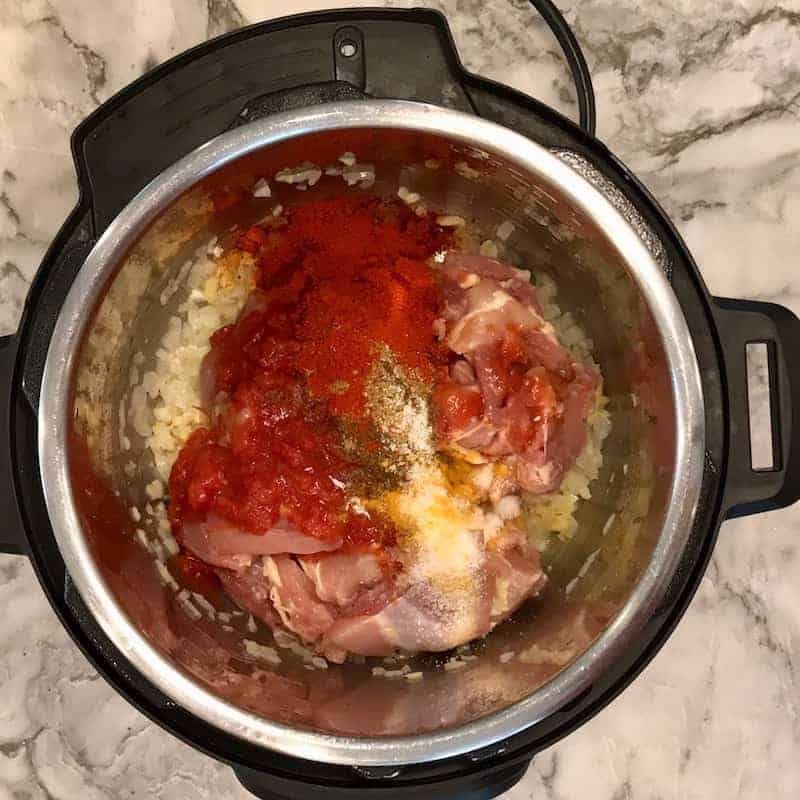 So simple with the Instapot, as usual I have to remember to double your recipes because I never get to enjoy leftovers! 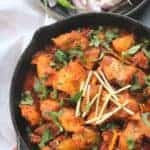 Hi/ can we use beef to make a beef karahi? How would that change the total cook time in the IP? Bought your book btw! Thank you! Thank you SO much! Do rate them when you get a chance. Yes you can. I would increase the pressure cook time to 8 mins.